Biological - Corax Oil - Francesco Piras Farm Company - Oil Mill in Alghero, Sardinia. Biological - Corax Oil - Francesco Piras Farm Company - Oil Mill in Alghero, Sardinia. 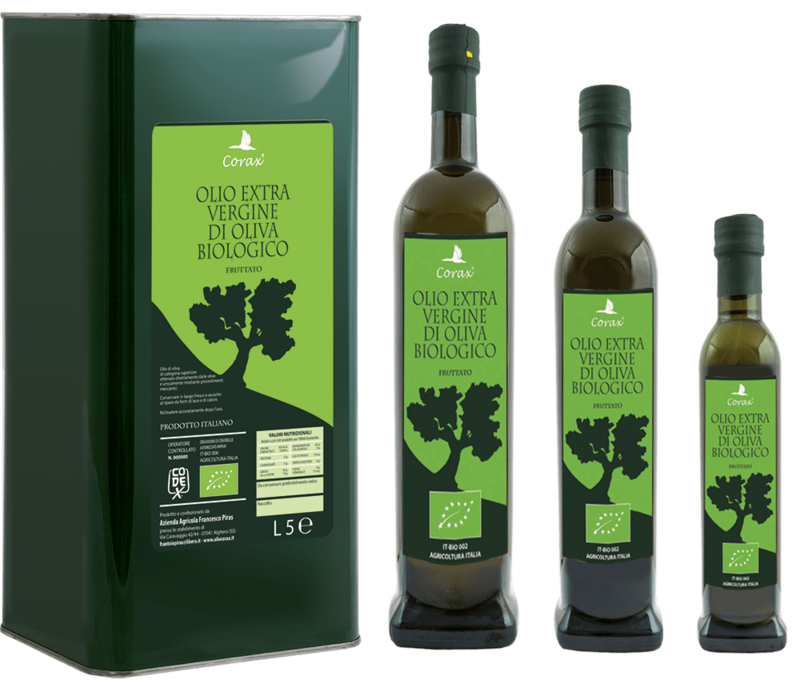 Corax Biological Fruity extravirgin olive oil belongs to the category of medium fruity, and is obtained from a mixture of oils from the two principal varieties of Sardinian olives: the Bosana and the Semidana. It is produced respecting the surrounding environment, using natural methods for pest control and the healthy maintenance of the plants. it is characteristic for its aroma of olives harvested at the right degree of ripeness, with flavours of grass and green tomato, and for its balanced taste, with notes of herbs and artichoke. Moderately bitter and pungent aftertaste. Mechanical harvesting directly from the tree; transport in bulk; grinding carried out within 12 hours; two phase continuous cycle cold pressing process; storage of the olive oil in temperature-controlled stainless steel cisterns with natural decantation. Cloudy aspect, intense-green colour, herbaceous fragrance of green tomato, balanced flavour with notes of grass and artichoke, moderately bitter and pungent aftertaste. It's recommended for use raw on first course dishes, in soups and as a dressing for vegetables and fresh salads.